We use our Brassica rapa experiment to prove that we can measure the exact mass and energy a population expends upon Darwinian fitness and competition. “the maximum number of individuals that a given environment can support without detrimental effects” (Houghton Mifflin Harcourt Publishing Company, 2011). the equilibrium age distribution values in numbers, masses, and energies that define that carrying capacity. We selected Brassica rapa as our demonstration population because it is an extremely well-known fast-growth plant whose genome has been thoroughly studied. It is very commonly used in scientific experimentation, and a small industry has grown to provide it. Our experiment and our results can therefore be very easily replicated—and validated—in any competent laboratory. Since we wanted it to be as self-evident and indisputable as possible that we successfully isolated all number-dependent effects—and only number-dependent effects—we grew our Brassica rapa under tightly controlled and uniform conditions throughout. We maintained constant pot sizes, constant light, and provided a constant water supply. Those growing conditions are also easily replicated. We began at a seed density below Brassica rapa's estimated carrying capacity. 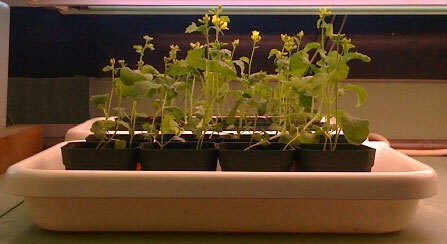 We then let the plants follow their intrinsic and natural cycle and rhythm … which we wanted to measure. We let them develop naturally to flower, fruit, and seed. We let the seed density at the end of each generation determine the seed density to plant at for the beginning of the next. We recorded all masses, energies, and numbers. We also recorded the generation time, T. As is standard in such situations, B. rapa suitably oscillated, over successive generations, in search of its equilibrium and its carrying capacity. We normalized our results so that the mean number per each distinct generation was always expressed per 1,000 plants. We called this normalized population, centred on 1,000, a “unit population”. We then used the standard techniques of population biology to calculate the equilibrium age distribution population. We calculated equilibrium mass and energy values for both (A) the individual Brassica rapa plants (m̅ and p̅) in each unit population; and (B) the whole population (M and P). We also expressed all those values in our unit and normalized terms. ∇ × P = (∫P dT /∫dp̅ dn) = ∂p̅⁄∂t + ∂W⁄∂t - ∂n⁄∂t. Our data, the four equations, and (A) and (B) tell us, through the partial derivative ∂n⁄∂t, which is the aberrancy, that Brassica rapa expends exactly 0.19 grams of mass and 1.225 joules of energy, over a 36 day period, upon Darwinian fitness and competition … and therefore that it does not follow any creationist and/or intelligent design template.